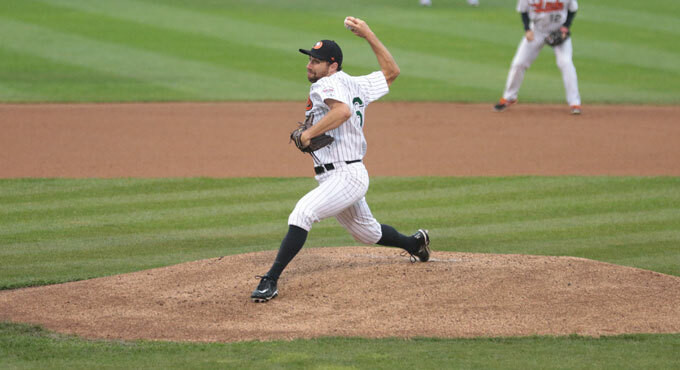 (Central Islip, N.Y., June 2, 2015) – The Long Island Ducks defeated the York Revolution 3-0 on Tuesday night in the finale of a three-game series at Bethpage Ballpark. Ducks starter Mickey Jannis (3-2) was outstanding on the mound, as he took a no-hitter into the eighth inning. However, with two outs in the frame, Wilson Valdez reached on an infield single to shortstop for York’s first hit. Jannis finished with eight shutout innings of work to earn the win, allowing just the one hit and five walks while striking out nine batters. The Ducks scored all three of their runs in the first inning against Revolution starter Rommie Lewis. Bases loaded walks to Jon Griffin, Prentice Redman and Mike Blanke did the damage. Lewis (3-3) suffered the loss, surrendering three runs on four hits and five walks with five strikeouts in five innings. Ryan Kussmaul earned his 10th save of the year with a scoreless ninth inning. Bryan Sabatella led the Flock with two hits in the game. Following a day off on Wednesday, the Ducks will hit the road for a four-game series against the Camden Riversharks beginning Thursday night. Game time is slated for 7:05 p.m. from Campbell’s Field. Right-hander Billy Buckner gets the start for the Ducks. Fans can follow all of the action live on the Ducks’ official YouTube channel. Streaming audio will be available online by CLICKING HERE. The Ducks will return home on Sunday, June 7 to begin a four-game series against the Southern Maryland Blue Crabs. Game time is slated for 1:35 p.m., with the Bethpage Ballpark gates opening at 12:35 (12:20 for season ticket holders). Fans in attendance at the game will be treated to a special one-day only appearance from Spider-Man, courtesy of Atlantic Chrysler Jeep Dodge RAM. The famous superhero will be greeting fans and posing for pictures on the main concourse outside the Waddle In Shop. It’s also a Sunday Family Funday at the ballpark! Prior to the game, fans will be invited onto the field for an autograph session with the Ducks from 12:50 to 1:05. Following the game, kids and kids at heart can take part in Kids Run the Bases, presented by Bethpage Federal Credit Union. Tickets the game and all Ducks home games are available by visiting the Bethpage Ballpark box office, calling (631) 940-TIXX or CLICKING HERE. Duck Tales: Mickey Jannis finished four outs shy of becoming the second Ducks player in franchise history to pitch a no-hitter. The only Duck to ever accomplish the feat was Rod Henderson, who did so on May 25, 2001 in what was also a 3-0 win. There have been seven no-hitters pitched in the Atlantic League’s 18-year history…In his last six outings (three starts), Jannis now has a 2-0 record with a 0.90 ERA. In that span, he has surrendered only 17 hits and eight walks while striking out 29. He has now thrown back-to-back starts of eight shutout innings and has combined to strike out 17 batters while yielding just four hits and five walks…Cody Puckett extended his on-base streak to 14 straight games with a single on Tuesday. During the streak, the infielder is batting .333 (20-for-60) with five doubles, six RBI and six runs scored. Puckett has also hit safely in eight consecutive games and in 13 of his last 14 contests…Ryan Kussmaul continued a strong line of pitching lately for Long Island’s bullpen with a scoreless inning of relief. In the Ducks’ last eight games, the relievers have combined to allow just three runs in 31 and two-thirds innings of work, good for a 0.85 ERA. The bullpen has also given up only 12 hits and five walks while striking out 26 batters in the eight games. RBI--J.Griffin (26), P.Redman (9), M.Blanke (5). SB--W.Valdez (11). E--S.Proscia 2 (5), R.Lewis (1), C.Puckett (7), D.Lyons 3 (6). R. Corona(2B) - C. Puckett(3B) - J. Griffin(1B). S.Smith, L.Ford, C.Puckett, J.Griffin, R.Corona, M.Blanke, D.Lyons.